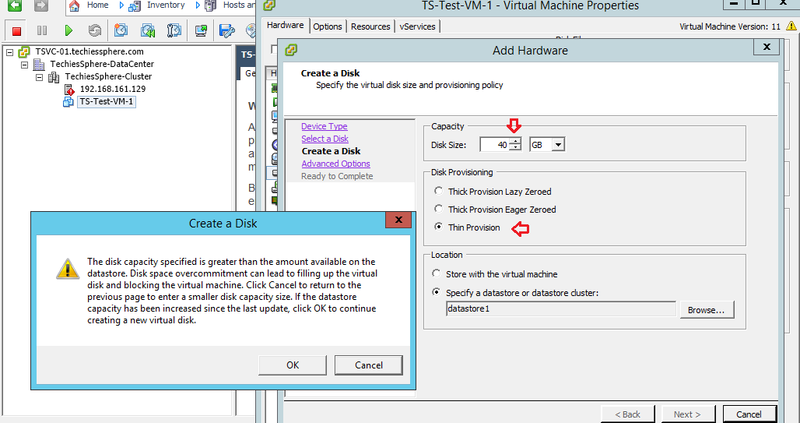 Descriptions: Thin Provisioning disk allocation method in VMware vSphere is one of the cool feature to use your storage to a limit beyond the storage capacity limit… There are some pros and cons of each provisioning method whether it is Thick or Thin but it’s all depends on your requirement and criticality of servers and how you want to use it. e.g. For database servers, I rarely think of allocating Thin Provisioned Disk. Because, Database log files and even Database can increase anytime drastically and if you don’t have enough free space on the respective Datastore, This VM will go in Answer mode (its equal to down till the time you fix it). 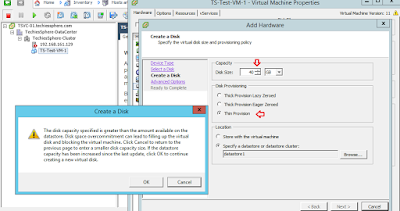 Thick Provisioning: This provisioning refer to disk provisioning method where all the allocated disk space is occupied by the Virtual Machine. Example: When you allocate 40GB drive space to a Virtual Machine with thick provisioning method, it reserves all 40GB allocated disk space from your Datastore. 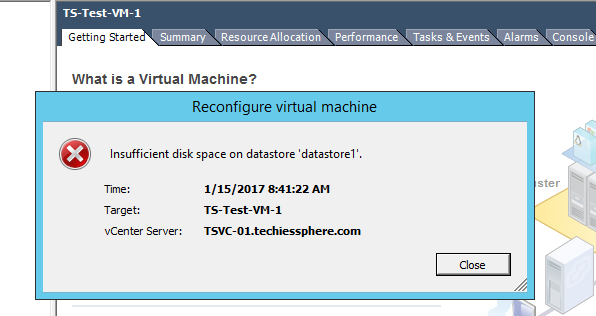 Even if the VM is having 10GB of data inside that drive, it will take complete 40GB space from the associated Datastore. There are further two type of thick provisioning, Lazy Zeroed and Eager Zeroed. Thin Provisioning: This provisioning method refers to disk provisioning method where only used space is occupied by the Virtual Machine. 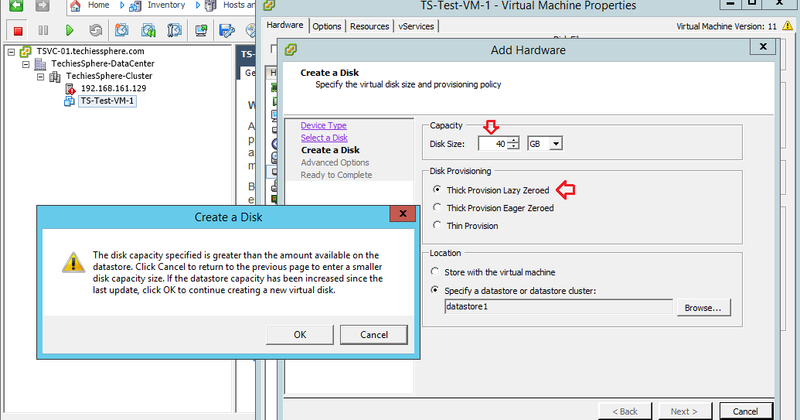 Example: When you allocate 40GB drive space to a virtual machine with thin provisioning, it does not reserve the complete 40GB allocated disk space from your Datastore. If your VM is using only 10GB of out of 40GB allocated drive space, then thin provisioning helps remaining free 20GB disk space to be released from that particular VM. Means, no matter how much drive space you have allocated for your VM, it will utilize only what it required. 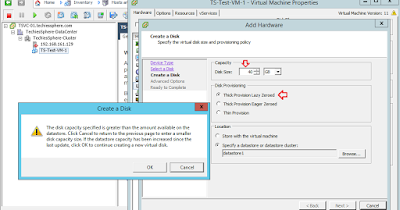 You can try it by assigning 40GB drive space with Thin Provisioning method to any VM even if you have 30GB of drive space free in your Datastore. It will allow you to do so. Reference screenshot-1: I have 20GB free space in Datastore and adding a Disk with 40GB capacity to my Test-VM-1 with Thick Provisioning Method. If you will dare to go with this option, you are going to end up with below error. Reference Screenshot-2: I have 20GB free space in Datastore and adding a Disk with 40GB capacity to my Test-VM-1 with Thin Provisioning Method.